We reached shirdi about 4p.m. We put in the Wada built for the convenience of people by R.B.Sathe. Madhavrao Deshpande was very obliging and helped us and treated us like guests. There are in the Wada Tatyasahib Nulkar with his family,Bapusahib Jog, and Bahasahib Sahasrabuddhe. We all went to see the Sayin Maharaj soon after our arrival. He was in the Musjid. After salutation I and my son offered the fruits brought by us and gave some money at his request. The Sayin Saheb then said that he has not been well for the last two years and more, that he used to eat only barley cake and take a little water. He showed his foot and pointed to a small sore, said it was the stringworm, that it wasextracted but string snapped and then it reaopeared and so on. He said he heard that it would not be well with him till he went to his native town. He said he kept it in view but that was all, he cared more for his people than even for his own life. It could not be helped. Then he told us to withdras which we did. Towards evening he passed by the Wada, and we went and saluted him. I and Madhavrao Deshpande were together. After we saluted, he said "Go to the Wada and sit quiet". So I and Madhavrao returned. We all Sat Talking. They have many Miracles to relate. In the morning I had a walk and after ath we all saw Sayin Maharaj going out with an embroidered big umberella held over his head. later on we went to musjid. Sai Baba appeared to be somewhat excited. Then he got up, distributed the food accumulated there, and after giving Udi-ashes, requested us to withdraw. We did so. The Midday meal was not served till nearly half past two in the afternoon. After it we sat talking, say sayin Maharaj in the evening when he came out for a walk. Lettar on we went to the Chavadi where Sayin Maharaj sleeps tonight. He was accompained by the Umbrella of state, Sliver stick, Chavaris and Fans etc,etc. The place was tastefully lighted. The lady who is known as Radhakrishna came out with lights. I saw her from distance. Madhavrao Deshpande said he would be away tomorrow and return the day after. He asked for and obtained Syain Maharaja's permission to go. In the morning after my Pryer, Mr. Baba Saheb Bhate, who is a retired Mamlatdar, came to the Wada and sat talking with us. He has been staying here for some time and has a peculiar kind of calm on his face. We say Sayin Maharaj as he was going out and went to him in the musjid in the afternoon. I, Babasaheb Sahasrabuddhe, my son Baba, Bapushaeb Jog and children went togetherand sat there. Sayin Maharaj appeared to be in good humour. He asked Babasheb Sahasrabuddhe whether he came from Bombay. abasahen replied in the affirmative. Babasaheb was then asked wether he would return to Bombay. He again replied in the affirmative, but added that he could not be certain of remaining there as it would depend on circumstances. Sayin Maharaj remarked, "Yes. It is true, you have many things on hand and have to undertake more. You will be here, you will be hear, you should see yourself. The experiences gone through are real. They are not fanciful. I was here thousand of years ago". The Sayin Maharaj turned to me and started on apparently a new track. He said "This world is funny. All are my subjects. I look upon all equally, but some became thieves and what can I do for them? People who are themeselves very near death desire and make me great deal. They hurt me a good deal, but I said nothing. I kept quiet. God is very great and has his officers everywhere. They are all powerful. One must be content with the state in which good keeps him. But Iam very powerful. I was here eight or ten thousand years ag". My son asked him to tell a story as he told him before. Sayin Maharaj asked what story it was. My son replied that it was a story about three brothers who went to a Musjid. One of them wished to go out and beg. The others did not want him to do that, on the ground that food obatined by begging would be impured and would pollute their chowka. The third brother replied that if the food spoilt the chowka his legs should be cut off & c. Sayin Maharaj said it was a very good story. He would tell another when he was in the humour. My son said he did not know when the thing would happen, and if the hummour recurred after he left, there would not be much use. There upon Sayin Sahib told him that he should rest assured that the story would be told before he left.I ak\sked him why he was angry yesterday and he replied that it was because the Teli said something. Then I asked him why he cried out "Do not Beat. Do not beat" today at the time of the distribution of food, and he replied that he cried out because the patil family was quarrelling and divided among themselves. Sayin Sahib spoke with such a wonderful sweetness and he smilled so often and with such extraordinary grace that the conversation will remain engraved in my memory. Unfortunately other people came and the conversation was interrupted. We were so sorry for it but it could not be helped. We returned talking about it. Tatyasahib Nulkar was not present during the first part of the conversation but came later on. Balasahib Bhate came in the evening and we sat again talking about conversation. In the morning, after prayer, we saw Sayin Maharaj As usual when he was going out. Leter on we went to see him in the afternoon but had to turn back as he was washing his feet. Babasheb Sahasrabuddhe, myself, my son and a certain gentleman who came this morning formed the company that went and had to return. Tatyasahib Nulkar did not accompany us. Leter on we went again, but Sayin Sahib dismissed very soon. So we returned. He appeared very much engaged in thinking out something. At night Sayin Sahib slept at the Chavadi and we went to see the procession. It was very nice. The gentleman mentioned above is a Police-Officer, I believe, Head Constable. He was charged with extracting money and tried by the court of sessions. He vowed to visit Sayin Maharaj if he was acquitted. He was acquitted and so came to fulfil his vow. On seeing him Sayin Maharaj appeared affected and said "Ehy did you not stay a few days there? The poor people must have felt disappointed". He repeated this twice. We learnt afterwards that the gentleman's friends pressed him to stay and that he did not comply with their request. He had never seen Sayin Maharaj before. The wonder is how Sayin Maharaj Knew him and said what he did. I and my son intended going away today. In the morining, after prayer when we went as usual to see Sai Maharaj, he asked my son if he intended going away and added that we may go away. We thought the necessary permission had been granted and made ready to start. Baba packed all things and engaged a spring cart and another to carry our things, and in the afternoon went to formally see the Sai Maharaj before actually starting. 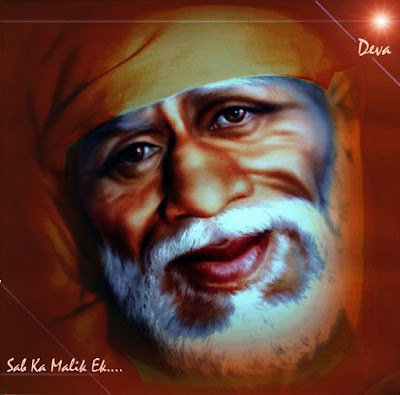 On seeing me Sai Maharaj said, "Do you really intend going?" Ireplied "I wish to go but not if you do not permit." He said, "Then you may go tomorrow or the day after. This is our house. The Wada is our house, and why need anybody be afraid while I am here? This is our house and you should look upon it as your own house". I agreed to stay and countermanded all engagements for departure. We sat down talking. Sai Maharaj was in a very pleasant mood and said many pleasant things but I am afraid I did not understand him. In the morning after prayer I told my son Baba never to mention anything about our going away to Sayin Maharaj. He knows all and would know Saheb as he was going out, and leter on when we went to the Musjid, Sayin Saheb was very much plised and told the story of a former life of a young girl who was playing with him. He said she was an artist and died and was as usual furied. Sayin Saheb passed that way and spent a night near her tomb. So she accompanied him. He kept her in a babul tree and then brought her here. he said he was kabir before and sed to spin yarn. The conversation was exceedingly plesent. In the afternoon Mr. Shridharpant Paranjpe of wardha accompained by one Mr. Pandit, another doctr, and a third gentalman came. Mr. Patwardhan, Junior of Ahmednagar was with them. My son and he are old colleg friends. They all went to see Sayin Saheb and we all accompained them. Sayin Saheb treated them the same way as he treats everybody and talked of buldings that are being put up and added, "The world is gone mad. Every man has acquired a peculiarity of evil thinking. I never put myself on an equality with any of them. So I never listen to what they say. Nay, I never reply. What should I reply?". He tyhen distributed "Udi" and told us to return to Wada. He singled out patwardhan Junoir and told him to stay behind as usua; mentioning "tomorrow" as the day of departure. I and Babasahed Sahasrabuddhe returned to Wada. It appears Paranjpe and his companions went to lady, Radhakrishna. Bapusaheb Jog's wife has beeb ill. She benefited very much by what Sayin Saheb says and he give on medicine but apparently she lost patience today and wanted to go anway. Even Bapusahed Jog, out of Sheer helplessness agreed to let her go. Sayiun Saheb made repeated inquiries about hewr and when she was giong. When however, int the evening Bapusaheb jog proposed to go formally to Sayin Saheb fo asking permission, she said she felt better and did not wish to go-we wondered. In the morning after I finished my prayer and had a wash, Mr. Haribhaoo Dixit of Bombay with a few companions, Mr. Tarkhad, son of the late Dr. Atmarang Pandurang, and Mr. Mahajani, who is a cousin of Annasaheb Mahajani of Akola, we went to Sayin Saheb as usual and today's conversation was both important and marked by two incidents. Sayin Maharaj said that he used to sit in a corner and desired to exchange the lower part of his body for that of a parrot. The exchange came and he did not realise for a year and lost one lakh of rupees. Then he began to sit near a post and then a great serpent woke up and was very angry. It used to jump up and also fall from above. Then he changed the subject apparently and sai that he visited a place and the Patil there would not let him go unless he made a plantation and hard footpath through it. He said he completed both. Some people came in at this time. To the man, he said, "You have nobody but me to look after you." Looking round he added that she was a relation of his and had married the Rohillas who looted the man. Then he said, the world is bad. People were not as they were before. Formerly they used to be pious and trustful. Now they were unbelieving and disposed to contemplate the evil side, and then he added something which I could not catch. It was something about his father, grandfather and his becoming the one and the other alternatively. Now as to the incidents, Mr. Dixit brought fruits. Sayin Saheb ate some and was distributing the others. Balasaheb, Mamaledar of this taluka, was there and said that Sayin Maharaj was giving away only fruits of one kind. My son told his friends Mr. Patwardhan that Sayin Maharaj accepted or refused the fruits in proportion to the devotion with which they were offered. My, son, Baba, tried to tell this to me and wished to do the same to Patwardhan. This made a little noise and Sayin Maharaj looked at me with an eye that blazed wonderfully and sparkled with anger. He demanded what I said. I replied that I was saying nothing and that children were talking with each other. He looked at my son and Patwardhan and changed the mood immediately. Towards the close Balasaheb Mirikar remarked that Sayin maharaj was talking all through to Haribhao Dixit. In the afternoon while we were at meals Mr. Mirikar's father who is an Inamdar and special magistrate at Ahmednagar came. He is a very respectable gentleman of the old stamp. I liked this conversation very much. In the evening we saw Sayin Saheb as usual and at night we sat talking, and Mr. Nulkar's son Vishwanath did Bhajan as he does every day. In the morning after prayer we saw Sayin Maharaj Passing out as usual and sat talking among ourselves as usual. Mr. Dixit appears to have turned a new leaf altogether and spends a good deal of his time in prayer, and his temper which was always mild appears to have acquired the peculiar sweetness which is entirely due to internal calm. Rao Bahadur Rajarampant Dixit came soon after from Pulgaon. He said he had no intention of visiting shirdi when he left Nagpur, but somehow at pulgaon he made up his mind to visit very suddenly and made the journey practically on the spur of the moment. I was very glad to see him. We all went to see Sayin Saheb later on. I was a bit late and missed a very interesting story told by him. He teaches in parables. It was about a man having a very beautiful horse, which, do what he could, would not go in pair. It was taken all round and given all the usual training, to no purpose. At last a Widwan suggested its being taken to the place from which it was originally brought. This was done and then the horse went all right in the harness and became very useful. I heard the fragment of the parable. Then he inquired when I was going. I replied that I would go when he gave me permission of his own accord to go. He replied, "You go today after talking your meals" and later on sent curds by the hands of Madhavrao Deshpande as Prasad to me. I had it at meal, and soon after it, went to Sayin Saheb. He confirmed his permission to go as soon as I went. My son did not feel sure of the permission and so asked expressly and the permission was given in clear words. The Sayin Maharaj today asked Daxana of others, but nothing of me or my son. I was very low in funds and he appeared to know it. After saying good-bye to Mr. Nulkar, Mr. Dixit, Mr. Bapusaheb Jog, Mr. Babasaheb Sahastrabuddhe, Mr. Madhavrao Deshpande, Balasaheb Bhate, Wasudeorao and others we left with Patwardhan, Pradhan, Kaka Mahajani, Mr. Tarkhad, and Mr. Bhide who came today. We caught the train about 6.30 p.m. at Kopargaon and traveled to Manmad. Mr. Bhide getting down at Yeola. I and my son will soon leave Manmad by the Punjab Mail. I slept well last night. My son and wife are doing well with Bhishma. Vishnu is also here. We fed a good many people today and I fell into the proper routine of the place. I saluted Baba Sayin Maharaj as he went out; then after he returned to the Musjid, and again in the evening, and later on again, when he went to sleep in the chawdi. The Bhajanpujan was a little less. After we returned from sheja-arti, Bhishma had his usual Bhajan and Mr. Thosar also song some verse, a few, of his own composition and others, of Kabirs, Das Gunu, and others. Das Ganu's wife Baya who was here last year, is now at her father's house. We set talking till late at night. Madhaorao Deshpande told us at night at Dada Kelkar had a nephew by name Babu. Sayin Maharaj was very kind to him. This Babu died and Maharaj remembers him to this day. Mr. Moreshwar Vishwanath Pradhan a Pleader practicing at Bombay, came to see Sayin Maharaj. On seeing his wife, Sayin Maharaj said that she was the mother of Babu. She got in the family way later on, and on the day of her delivery in Bombay, Sayin Maharaj here said he had pains and that twins would be born and that one of them would die. So it happened, and when Mrs. Pradhan came here on his lap and asked if he would come to the place, and the child of two months distinctly answered "Hoon". I forgot to mention yesterday and the day before that Upasani Vaidya, that use to be at Amravati, is here and saw me soon after my arrival. We sat talking. He told me briefly his story since leaving Amravati, how he went to Gwalior state, how he purchased a village, how it became nonpaying, how he met a Mahatma, how he got ill, how he tried all remedies, applied to various sadhoos and Mahatmas, how finally Sayin Maharaj took him in hand, how he improved, and is now under order to stay here. He has composed a stotra of Sayin Maharaj in Sanskrit. We all got of early and attended the Kakad Aarti. It is very edifying. I prayed, bathed, and saw Sayin Maharaj go out, then again he returned and once more in the afternoon. Sayin Maharaj, looking at me said "Ka Sarkar" Then he gave the general advice that I should live as God keeps me and added that a man fond of his family has to bear many things & c. & c., and told the story of a rich man who starved till evening, cooked for himself and ate a very rough bread, all on account of temporary difficulty. We saw Sayin Maharaj again in the evening and sat in the verandah of the house built by Dixit. Two gentleman from Bombay brought a Satar, and playing on it, said Bhajan. Mr. Thosar, whom I call Hazarat, also sang very beautifully and Bhishma had his usual Bhajan. Time passed away pleasantly till midnight. Thosar is a very pleasant companion. I had a long talk with my son Balvant, the Bombay men and others about contemplation etc. I was late in getting up and finishing prayer. Mr. Chandorkar came today with a servant. Many others also came and some that were already here went away. Mr. Chandorkar is a very nice simple man, very pleasant in conversation, and plain in his dealings. I went to the Masjid and sat long listening to things said there. Sayin Maharaj was in a pleasant mood. I took my Hukka there and Sayin Maharaj had a smoke out of it. He looked wonderfully beautiful at Aarti-time, but dismissed every one very soon after it. He said he would come to dine with us. He calls my wife "Ajibai". On returning to our lodging we learnt that Mr. Dixit's daughter who was ill, passed away. The deceased dreamt a few days ago that Sayin Maharaj kept her under Nim tree here. Sayin Maharaj also said yesterday that the girl was dead. We sat talking about the sad event. The child was only seven years old. I went and saw her mortal remains. They were very beautiful and the expression on her face after death was peculiarly charming. It reminded me of the picture of Madona that I saw in England. The cremation took place behind our lodging. I attended the funeral and did not breakfast till 4 p.m. Dixit bore the blow beautifully well. His wife naturally broke down under grief. Everybody sympathises with her. In the evening I went to the Chavdi to see Sayin Maharaj both at sunset, and later on at Sheja-Aarti time. At night, I, Madhavrao Deshpande, Bhishma and others sat talking till late, all about Sayin Maharaj. Thosar got permission from Sayin Maharaj to return to Bombay. He will go tomorrow morning. In the morning before I finished my prayer Dattatraya Chitnis, Solicitor of Bombay, came. He was a freshman when I was a fellow in the college. So he is an old, old friend. He naturally sat talking of old days and so on. As usual I saw Sayin Maharaj as he went out and later again when he returned and sat in his usual place. We all returned after Aarti. The breakfast was a bit late and after it I sat talking with Upasani, later on with Mr. Nanasaheb Chandorkar. He is the chief, if not the oldest disciple of Sayin Maharaj. He is a very pleasant man, gave me his history as to how he came into contact with Sayin Maharaj and made his progress. He wished to tell me the instructions he received but people gathered, and the things could not be disclosed to the view of all. I made two attempts to see Sayin Maharaj in the afternoon, but he was not in the mood to see anybody. I saw him in the evening near the chawdi and had a long talk with Sathe saheb, Chitnis and others. There is one Gokhale come from Narsoba's Wadi. He says he was directed to see Narayan Maharaj of Kedgaum and Sayin Maharaj. He sings very nicely and at night I got him to sing a few Bhajans. Mr. Nanasaheb Chandorkar returned to Thosar today. Balasaheb Bhate, who got a son a few days ago. lost him this evening. This was very sad. Sayin Maharaj this afternoon prepared some medicine which he took. The prayer this mornings was very very pleasant and after it I felt quite elevated. Then I sat explaining the first few verses of Panchadashi to Dattatraya Chitnis. He is a very nice man. Then we visited Sayin Maharaj, both as he went out, and after he returned. He gave me the Chillam very often and grapes that Radhakrishnabai had sent. He gave the grapes twice to my son Balwant. In the afternoon I heard that he was cleaning the masjid. So I didn't attempt to go that side. All the people brought a deputation to Sayin Maharaj to get rid of the plague. He advised them to clean the roads, sweep the tombs and burning and burial ghats and to feed the poor. I spent the whole afternoon reading the daily papers and talking to Chitnis and others. Upasani is composing something. In the evening we saw Sayin Maharaj near Chawdi and again attended the Seja-Aarti after which Chitnis, his engineer friends, and another went away. I and Bhishma got up very early under the impression that the Kakadarti was about to begin, but we were early by about an hour. Later on Megha came and we attended the Arti. Then I prayed and sat waiting for Sayin Maharaj to go out. I saw him then and again after he returned. I spent the interval in listening to the songs of Gokhale. He sings well. Today the breakfast was late as Megha could not get the leaves of Bela and had to go a long distance for them. So the midday Puja was not finished till about 1-30 p.m. Sayin Maharaj was in very good mood and sat chatting and laughing. After breakfast I lay down for a few minutes and then went with my people to the Musjid. Sayin Maharaj was in a good mood and told a story. Taking up a fruit lying there he asked me how many fruits it was capable of producing. I replied as many times thousands as there were seeds in it. He smiled very pleasantly and added that it obeyed laws of its own. He also told how there was a girl very good and pious, how she served him, and prospered. We got "Udi" about sunset and then stood opposite the Chawadi to see Sayin Maharaj when he comes out for his evening stroll. We say him and returned and sat listening to the Bhajan of Bhishma, Gokhale, Bhai and one young man Dixit. Madhavrao Deshpande and Upasni were present. The evening passed very pleasantly. Page created in 0.232 seconds with 64 queries.